Consumers are adapting to a changed economic landscape by cutting back on their credit card spending, attempting to pay down debt and monitoring interest rates, according to a new nationwide poll from CreditCards.com. Part 1: Three out of four Americans agree the government should regulate credit cards and 82 percent say the cards are essential to their lives. Part 2: How credit cards are changing the way Americans live. Part 3: Managing credit cards and relationships. The second annual CreditCards.com "Taking Charge" telephone poll, conducted by GfK Roper Public Affairs and Media, found that nearly one in four U.S. cardholders spent less on household expenses such as groceries in June than in previous months, with even larger numbers of consumers cutting back in other areas. Almost one-third of consumers say they are spending less on discretionary purchases, such as eating out and shopping at the mall, while a little less than half say they limited their purchases of major items, such as big appliances and furniture. Taken as a whole, the poll shows a sort of financial Darwinism at work. Most consumers are reacting reasonably to financial difficulties by pulling back on discretionary spending, and express little concern about their abilities to pay down debt. But those who can't or won't adjust are finding themselves in deeper and deeper debt trouble. It's plain just how deep that hole has become, with U.S. credit card debt topping $968 billion in June, according to the Federal Reserve's latest consumer revolving credit debt data. The "Taking Charge" survey results are based on random-digit dialed telephone interviews of 1,001 U.S. residents 18 and older, conducted June 4-June 26, 2008. The margin of error is plus or minus 3 percentage points for the full survey sample. Today's survey release is the second of a three-part release of the survey results. On Aug. 13, 2008, CreditCards.com released part one, Nearly 3 in 4 feel need for more credit card regulation. See poll methodology. 25 percent of U.S. cardholders say they spent less on household living expenses last month compared to normal. One-third of cardholders report that they ended the previous month with a lower outstanding balance than the month before. 34 percent say they spent less on discretionary expenses, such as eating out or shopping at the mall; 46 percent say they spent less on major purchases, such as appliances or furniture. Some consumers are giving up on credit: The proportion claiming to be a current cardholder has dropped four percentage points since the 2007 "Taking Charge" survey. Despite all the bad economic news of the past year, American cardholders are no more worried about paying their credit card bills than they were last year, with 27 percent agreeing with the statement, "At times I worry about how I'm going to pay my credit cards." That figure is unchanged from last year's poll. Only 7 percent of Americans say they worry "a lot" about paying off their credit card bills; 63 percent say they are not at all worried. People are hunting for low interest rates. 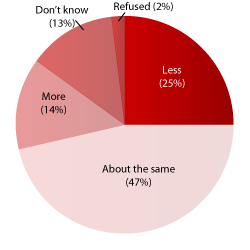 Nearly 4 in 10 surveyed agreed that they are always looking for low interest rates to transfer their existing balances, while 67 percent of cardholders agree that they "actively monitor" the interest rates on their credit cards. One possible reason for a relative lack of concern over credit cards is that people have even bigger worries than plastic, such as paying for health care and a place to live. In both the 2007 and 2008 polls, people were asked about the financial concerns that cause them to lose sleep. According to the poll, there has been a statistically significant increase since last year in the number of people worried about their health care or insurance bills (with those reporting "sleep loss" rising from 19 percent in 2007 to 28 percent in 2008) and people worried about being able to pay their mortgage or rent (rising from 14 percent to 20 percent). With household incomes below $75,000. Who have four or more credit cards. Who are older than 40. The "Taking Charge" survey suggests that when it comes to credit card spending, those who can cut back, do. "People are choosing to spend less," says Michael McCall, professor of marketing and law in the school of business at Ithaca College in Ithaca, N.Y. "It doesn't look like there's a lot of change, but 25 percent of people are spending less on living expenses." McCall notes that when times are tough, consumers become more selective about where their money goes, as evidenced by the rise of thrifty innovations such as the "staycation." It doesn't look like there's a lot of change, but 25 percent of people are spending less on living expenses. In an economic slowdown, people trim discretionary expenses before others. "When you don't have much money, the first thing that gets cut is eating out," McCall says. Large purchases are likely to also get put on hold, with peopling opting to nurse along an ailing fridge or put off home improvements until next year, McCall says. The data show that consumers who earn less appear quicker to cut back. "One consistent pattern I see is that people earning less than $75,000 report spending less than the previous month," says Amar Cheema, assistant professor of marketing in the Olin Business School at Washington University in St. Louis. For individuals with one to three credit cards, cardholders earning less than $75,000 a year are significantly more likely to report spending less in each category -- staples, discretionary purchases and major items. That's a positive sign, says McCall. "At least they're paying attention to" where their money goes, he says. According to Cheema, it may be a sign of something else, as well: Consumers may be cutting back because card issuers have gotten stricter about offering credit. "Specifically, those who have one to three cards report this decrease in spending, but those who have four or more cards do not," he says. "This may indicate that the curtailing of expenditure reported by respondents who earn less than $75,000 was driven by availability of credit," he says. "My hypothesis here is that people who have four or more credit cards have more available credit." Cardholders also seem increasingly aware of the importance of paying off credit card debt. They were presented with a hypothetical situation: Imagine you had $10,000 in the bank and $10,000 in credit card debt. What would be the financially wisest choice? More than three in four -- 78 percent -- say they would use extra cash to pay off their credit card balance. That's up from 73 percent last year. Did you spend more, less or about the same as normal on household living expenses, such as groceries? The data show married women are slightly more likely to save rather than pay off debt. "It seems that among married couples, women are more likely to want money in the bank, perhaps for an emergency, even though there are credit card balances," says Cheema. That isn't surprising, says Mary Beth Pinto, director of the Center for Credit & Consumer Research at Penn State University's Behrend College in Erie, Pa. "Studies have shown women tend to be more risk averse," she says. "They tend to be the primary caregivers in terms of all health care issues for the family and they tend to be the primary shopper for the family." Adaptation doesn't just mean spending less or making more payments on your card. It also means making sure that your card has the lowest possible interest rate that you can find. That can take some work, but a significant number of consumers say they are keeping an eye on both their own credit card interest rates and the rates offered by other cards. Cardholders earning less than $75,000 are especially likely to seek cards with better rates. Among that group, close to half (46 percent) say they are always looking for low interest rates to transfer their existing balances, compared with 33 percent of those in the higher income bracket. Pinto notes that consumers who revolve a balance are the same consumers who would be interested in keeping tabs on credit card rates. "I could never tell you what the interest rate on my credit card is because I pay it off at the end of the month," she says. The rising cost of living means their credit card balances and interest rates could become more important to more consumers. With expenses on the rise, "your money only goes so far," Pinto warns. To cover even basic expenses, "you're going to have to cut back somewhere, or you're going to have to put it on credit cards," she says. You're going to have to cut back somewhere, or you're going to have to put it on credit cards. For households earning less than $75,000 a year, "You may be relying on your credit card for more of your daily expenses and when the end of the month comes you may be unable to pay it off," Pinto says. Cardholders who charge daily expenses but who are unable to pay their entire credit card bill each month rely on credit cards as an installment loan rather than using plastic simply as a convenience. "You're coming up with a profile here," she says. "People that are interested in this are the people that are more at risk." McCall highlights that with the 13 percent of consumers who "somewhat disagree" that they actively monitor rates on the cards they hold and the 18 percent who "strongly disagree," there is some room for concern. "Over 30 percent of the people don't pay attention. That's scary," he says. The CreditCards.com "Taking Charge" survey was conducted by GfK Roper Public Affairs & Media, which interviewed a total of 1,001 U.S. residents 18 and older between June 4 and June 26, 2008. Respondents were obtained using random digit telephone dialing procedures to provide statistically representative samples of the U.S. population. The margin of sampling error is plus or minus 3 percentage points for the full sample, and higher for comparisons among subgroups. See related: 2008 "Taking Charge" survey, Part 1: Nearly 3 in 4 feel need for more credit card regulations, 2008 "Taking Charge" survey, Part 3: Snooping and arguments go along with joint credit, 2007 "Taking Charge" survey, Card issuers getting stingier about issuing credit, Credit card statistics, Is the American love affair with credit cards over?